Low Vision is a condition in which your vision cannot be corrected by glasses, contact lenses, surgery or medicine. Those with Low Vision typically have difficulty reading, writing, watching television, recognizing people’s faces or engaging in other daily living tasks. Fortunately, the visually impaired can be helped with a service called Low Vision Care. People who have vision loss are said to be visually impaired or to have Low Vision. Low Vision Care is professional care provided by an optometrist, who specialises in helping patients maximize their remaining vision. This care usually involves an evaluation and the use of solutions called low vision aids that include both magnification devises such as magnifiers and non-optical products such as task lighting. 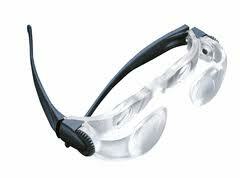 To find the right solution for you, we have a range of magnifiers and task lighting available in store for you to try.